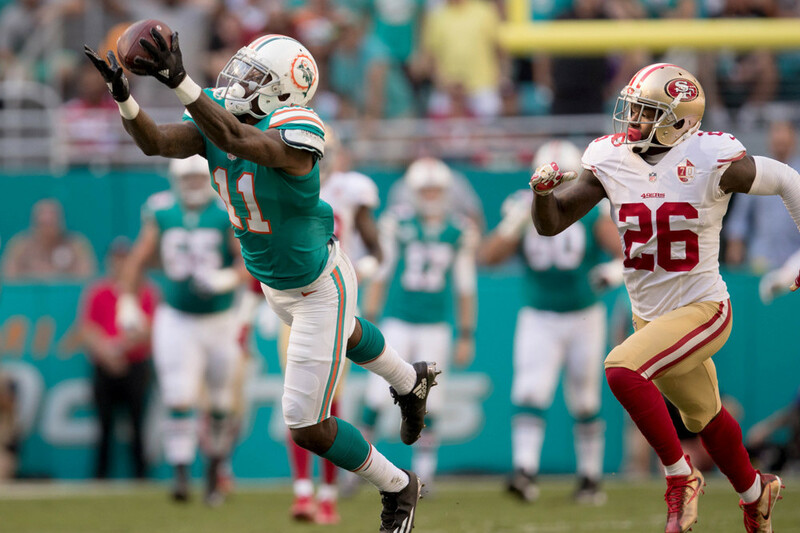 Proclaiming DeVante Parker a “sleeper” has become a reccurring theme in fantasy football. Yet, the Miami Dolphins wide receiver has failed to deliver the breakout many predicted. His first two seasons can be described, at best as, okay. Since entering the league, the former first-round pick has faced an onslaught of issues—both on and off the field. Parked has battled multiple foot and hamstring injuries. Even more troubling, he has developed a reputation for having a poor diet, sleep and work ethic. None of which are glowing endorsements. Despite these concerns, expectations continue to remain high. In a recent interview, the team’s offensive coordinator said he believes Parker has changed his routine and is poised for a huge 2017. He even went so far as to predict a “gigantic” season for the third-year wideout. There is plenty of room for improvement if Parker hopes to reach these lofty goals. In 14 games last season, Parker accumulated just 56 catches for 744 yards. While this was second on his team, these totals didn’t even rank him in the top 50 fantasy wide receivers in standard scoring leagues. The talent, size and skill have always been present. The three reasons below explain why Parker is primed to finally “awaken” as a fantasy football sleeper. A trendy sleeper pick himself entering the year, Ryan Tannehill posted the fewest passing yards of his career (2,995) and the lowest touchdown totals (19) since his rookie season. He finished as just the 27th quarterback in standard fantasy leagues. As bad as that sounds, there is reason for optimism. He was fifth in completions of 40-plus yards and third in completion percentage on passes over 20 yards. Tannehill showed consistency and efficiency in taking shots down the field. All of these benefit Parker tremendously. Parker managed only 5.9 yards per target last season. With Tannehill’s continued growth, expect Parker to see more big-play opportunities. While there is a lot of competition for touches in the Dolphins’ offense, this actually works in Parker’s favor. The emergence of Jarvis Landry and Jay Ajaji last season should mean Parker sees much less attention from defenses. Landry was the 16th best wideout in standard fantasy leagues, hauling in 94 receptions for 1,136 yards. After taking over near mid-season, Ajaji rumbled for over 200 yards in three different games. Although the coaching staff has declared they will commit to running the ball more next season, this could free Parker up as teams attempt to stop this duo of Pro Bowl options. Finding a sleeper is all about balancing a player’s upside with where they are being drafted. Because Parker has been a popular speculation in the past, he has often been overdrafted. Coming off back-to-back, injury-plagued seasons, the timing may finally be right for fantasy owners to maximize their value since he is reportedly finally healthy. According to recent mock drafts, Parker’s average draft position falls in the middle of the ninth round, making him an attractive late-round option. Don’t overthink Parker’s sleeper potential. Parker has never been more valuable as he enters his third season, which is when many wide receivers often see the biggest breakout.